Issue 40 is one of our best issues yet! 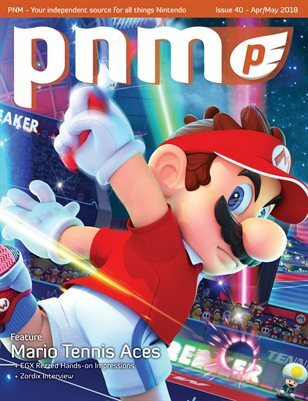 Mario Tennis Aces, which I am personally really excited about, graces the cover this issue and Jemma takes us on a deep-dive with everything the latest Mario Tennis outing has to offer. If you weren’t a fan of Mario sports games before, I think Aces and its story mode will make you a believer. Roy got to experience EGX Rezzed recently and reports on several upcoming indie titles for the Switch. Joe spoke with Matti from Zordix on their recent releases and what’s next for the studio. We also have a brand new Comic Corner, Culture Connections, Cartoon Corner, and more! And as always, we have a lot of new reviews and some great concept art! Happy Gaming!